In 1928, Clara Darden is proud to be the only female faculty member at the Grand Central School of Art, but she has to fight to be taken seriously as an instructor and an artist. Clara specializes in illustrations for magazines, but she is more talented than most of the male artists on staff, which causes resentment. Clara is forced to take drastic measures to bring attention to her fabulous artwork, but then she disappears in 1931. In 1974, newly divorced Virginia Clay gets a job at the Grand Central terminal building. Things don’t go as expected for Virginia, but on a terrible day at work, she is pleased to make an exciting discovery within the terminal building. 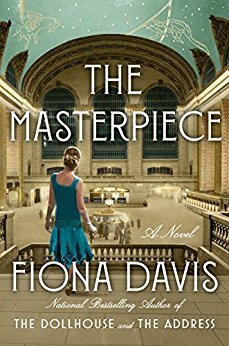 She finds rooms that had been part of the art school and in one of the rooms, discovers a beautiful watercolor that could be valuable not only in terms of its price tag but also its place in the art world. The Masterpiece alternates between Clara and Virginia’s point of view. It starts with Clara’s story to lay the groundwork for Virginia’s discovery years later and her experiences after finding the watercolor. Telling the story this way helps to build suspense about Clara’s life, but it means it takes longer to connect with either woman and to get to the more interesting parts of the story. Each woman is a product of their times and make some questionable decisions in their personal lives, and I don’t always like them. This also made it hard for me to get into the story. However, the pace picks up as the book continues. In the later chapters, both Clara and Virginia’s best qualities come out making them easier to relate to. It’s exciting to see all they ultimately accomplish. Although what happened to Clara was unknown and there are questions about the watercolor, this isn’t a typical mystery. The set-up was there for more of a thriller, but it wasn’t that kind of book. The story starts slowly for me, however I’m glad I stuck with it. The payoff at the end was well worth the wait. I was surprised by the twist in the story and how it ended. I enjoyed the message of hopefulness and refusal to give up on something you believe in. I greatly enjoyed the author’s note at the end of the book giving the historical background about Grand Central Terminal and the Grand Central School of Art. I didn’t realize how much of the book was based on actual historical events. This made me appreciate the story more with the way fact was mixed with fiction and and raised my overall impression of the book.